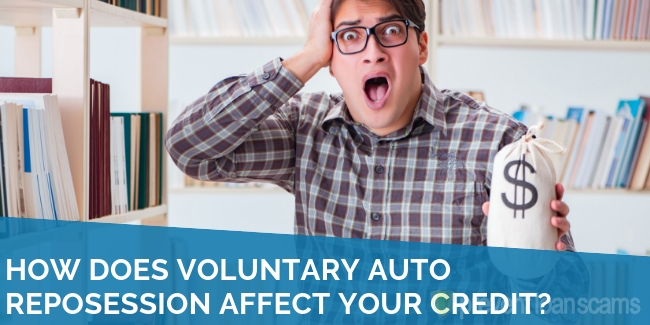 How Does Voluntary Auto Reposession Affect Your Credit in 2019? Home » Credit Help » How Does Voluntary Auto Reposession Affect Your Credit? You might think that voluntary auto repossession is better for your credit than having the situation forced on you. Unfortunately, this is a common misconception. While generally less stressful than having your car forcibly towed, voluntary repossession has the same effect on your credit. However, if there’s no way to avoid it, planning repossession is preferable to having the lender plan it for you. Let’s go through a few ways and discuss how voluntary repossession affects your credit. You should do everything in your power to avoid repossession in the first place. When you find yourself behind on bills and perhaps unable to make ends meet, one of the most important things you can do is call your financial institutions. Repossession is more expensive and less profitable for your lender than it is for them to give you a bit of breathing room with your loan. Financial institutions want you to succeed and would far prefer you pay your loan then take your car back. Once you realize you’re in dire financial straits, give your lender a call. Be honest and forthright and ask them for assistance. Many lenders will offer deferred payments or new loan terms. Agreeing to new terms or putting off payments will also affect your credit but not nearly as bad as a repossession. The very best way you can avoid voluntary repossession is to budget appropriately. Ensure that you can afford the payments you’re taking on before you sign any paperwork. Write out your debt obligations and income and ensure there’s still a bit left over. It’s going to be alright. Your first step is still to call your lender. If they have nothing available that can help you with your payments or you are not eligible for assistance, then voluntary repossession is the best-case scenario. Lower fees – When lenders take your car back for non-payment, they have to send over a tow truck to pick up your car. Tow trucks aren’t free and that balance will be tacked on to the outstanding debt you already owe. By voluntarily turning in your car, you are avoiding these extra dollars and cents in an already bad situation. Timing – That tow truck driver isn’t going to conform to your schedule. He’s got a lot of stops to make and yours is just one. He’s going to pick up your car whenever he wants and has the legal right to do so. Voluntary repossession allows you to choose when and where you have to leave your car. Credit Report – All repossessions negatively affect your credit report. However, it is possible that a voluntary repossession is slightly better. This depends on the lender and the credit reporting agency. So, how does it affect my credit? Badly. A repossessed vehicle will drastically lower your credit score, sometimes as much as 100 points. This is in addition to any late payments that you still have outstanding as your car was on its way to repossession. Keep in mind too, that each one of these missed payments and the repossession request could be listed as a separate line on your credit report. This looks very bad to a lender, who may not be discerning enough to see whether you had your car repossessed or turned in the keys yourself. Worse still, the repossession will stay on your credit report for seven years and you will have an extremely difficult time getting another car with the blemish still present. This affects more than just cars. Getting credit to purchase anything in the future could be extremely difficult, especially lines of revolving credit like credit cards. Finally, after all is said and done, voluntary or forced repossession, you may still owe the lender money! If your remaining balance was $10,000 and your car sold for $8,000, you still have to pay that $2,000 back. This is also a misconception when it comes to repossession that if your car is repossessed you won’t have to pay any remaining money you owe back. Incorrect! You’ll be on the hook for the remainder of the loan and you won’t even have a car to show for it! Your lender may want to wash their hands of the situation and send the debt to collectors. The lender or collectors can then, if you do not pay them, go to court and get permission to garnish your wages. Keep in mind too that the company tasked with collecting your debt will also mark your credit report. So now, you have your lender marking your report with delinquent charges, a repossession, and the debt collector reporting that they are actively collecting. Avoid it in the first place. Talking to your lender about issues you’re having making payments is a great first step. They want to work with you and have a financial interest in helping you to pay back your loan. Second, if you can’t make the payments and will, in no uncertain terms, end up in repossession, consider selling the car yourself. This can salvage your credit, especially if the proceeds for the car are worth more than your loan. Third, remember that owning and operating a car is a financial commitment. If you’re having trouble making payments, it may be good to consider alternate transportation, like buses, trains or carpooling. Finally, if you really must have car to get to and from work or run errands, consider a used vehicle and consider paying cash for all or most of the purchase. This leaves you with a car that you unequivocally own. Voluntary repossession is extremely damaging to your credit. With no other options, it is preferable to letting them forcibly repossess your car, because you can keep costs down and control the time you lose your vehicle. Still, you should try to avoid any type of repossession at all costs. Working with your lender or even selling your car yourself is preferable to letting them repossess your car.